The power of the Hondsrug region rests on its unique geomorphology. 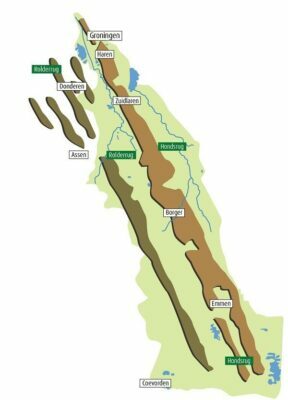 The concept of geomorphology refers to the land formation, and that of the Hondsrug region is unique. During the last but one ice age the surface of the Northern Netherlands was shaped by a river of ice, flowing from the northwest to the southeast, resulting in the straight parallel ridges of the Hondsrug complex. This occurred towards the end of the Saalian Ice Age, some 150,000 years ago. Nowhere else in Europe is there a similar large-scale linear landscape formation, and the only known comparable example of a megaflute lies in Canada. The Hondsrug is the most prominent boulder clay ridge or megaflute, 70 kilometres long and locally over three kilometres wide. Second is the Sleener- or Rolder Ridge of approximately 60 kilometres. Both lie entirely within the UNESCO Geopark. The scientific argumentation about the origin of the megaflute can be found in the report by Enno Bregman. As explained above, the Hondsrug and other smaller ridges in the Hondsrug region were all created in the Saalian Ice Age. The ridges consist of layers of sand which in the ice ages were covered with boulder clay. During the Weichsel Ice Age this was in turn covered with more sand. During the Saalian Ice Age broad valleys were carved parallel to the ridges, deeply eroded by rivers of meltwater. In the Weichsel Ice Age cover sand was deposited and in the Holocene they became filled up with peat. This is how the present day wide but shallow stream valleys were formed. On the eastern side is the Hunze valley and on the west side the Drentsche Aa and the upper reaches of the Overijsselse Vecht. 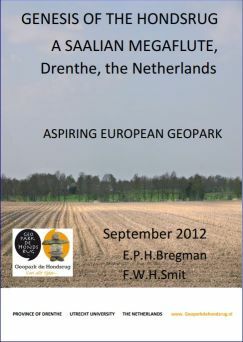 Besides the ridges and valleys in the Hondsrug region many other traces of geological and cultural history can be seen. In at least two places the Hondsrug was breached by water gaps, created by melt water valleys during the two last ice ages. These are the Voorste Diep near Borger and the Besloten Venen between Glimmen and Noordlaren. Where these flow out into the Hunze valley we find sandurs or outwash plains. In the Weichsel Ice Age pingo’s were formed through frost in the surface. They are now mainly present as marshy, round depressions or small fens. There are hundreds of collapsed pingo’s in the Hondsrug region, often found in small clusters. All over the Hondsrug the sand layer on the surface is predominantly cover sand deposited in the Weichsel Ice Age. These deposits are not evenly distributed but form ridges, arches and outcrops often clearly visible in the landscape. Where the cover sand has been blown by the wind – as is the case in some places in the Hondsrug region – we find deposits of blown sand. This is caused by wind and rain in places where there is no longer any vegetation. During the Holocene peat deposits appeared in the valleys between the ridges. 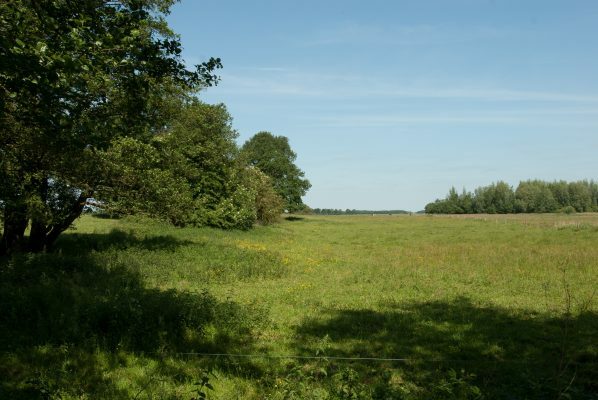 Particularly to the east and south of the Hondsrug were layers of bog several metres deep. Almost all were later exploited by turf diggers in the peat colonies. Only in a few places was the peat left untouched, as in the Bargerveen in the southeast of Drenthe.